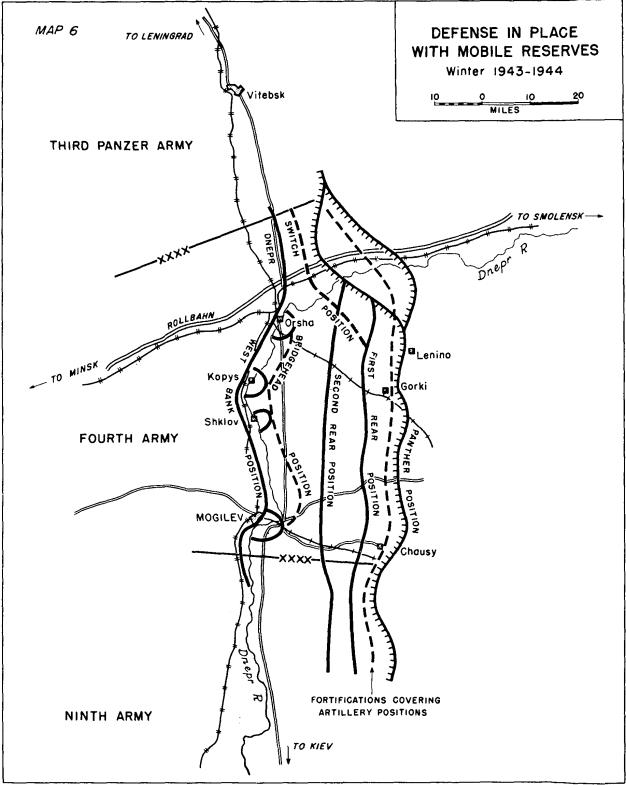 Even large-scale offensives can be stopped by a defense in place if a number of successive positions are available and the infantry holding the front line has strong artillery, tank, and assault gun support. The reserves must be mobile so they can be shifted from one sector to another in time to prevent or at least contain an enemy penetration. This can be achieved only if the road net is in good condition and sufficient transportation is available. A conflict entailing simultaneous fighting in different theaters of war and at different fronts within each theater may easily produce a shortage of combat forces which can be overcome only by improvising reserves. In such a situation, security and supply troops, as well as other service units, may have to be committed along extensive, quiet sectors to release combat forces for the formation of reserves. A correct estimate of the enemy’s intentions is essential for the timely withdrawal of units from apparently safe sectors.